The world Synod of Bishops on the family is not a parliament where participants will negotiate or lobby, Pope Francis said, but it must be a place of prayer where bishops speak with courage and open themselves to “God who always surprises us”. Opening the first working session of the synod on 5 October, the pope said the synod’s 270 voting members need courage, “pastoral and doctrinal zeal, wisdom, frankness and to keep always before our eyes the good of the church and of families and the supreme law – the salvation of souls”. The synod is not a convention or a parliament, Pope Francis said, “but an expression of the church; it is the church that walks together to read reality with the eyes of faith and with the heart of God”. The synod hall and its small working groups, he said, should be “a protected space where the church experiences the action of the Holy Spirit”. In a spirit of prayer, the pope said, the Spirit will speak through “everyone who allows themselves to be guided by God, who always surprises us, by God who reveals to the little ones that which he has hidden from the wise and intelligent, by God who created the Sabbath for men and women and not vice versa, by God who leaves the 99 sheep to find the one missing sheep, by God who is always greater than our logic and our calculations”. 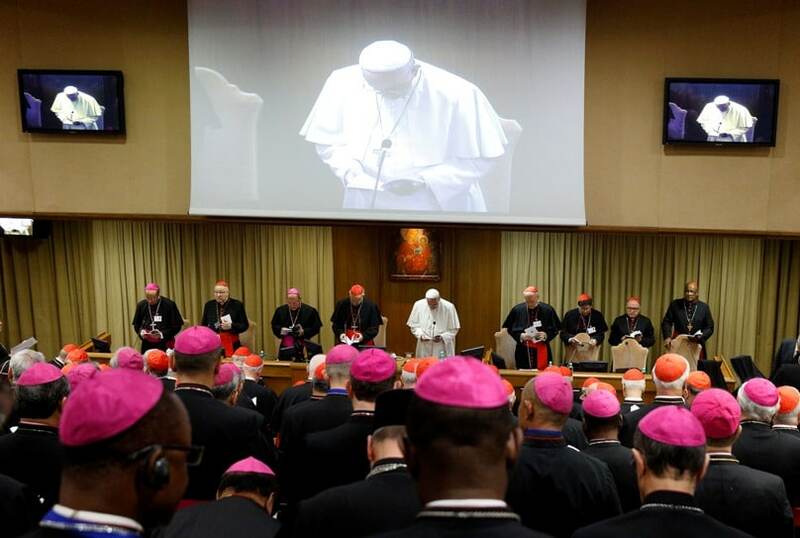 Synod members need “an apostolic courage that does not allow itself to be afraid in the face of the seductions of the world” that are attempting “to extinguish in human hearts the light of truth” and replace it with “little and temporary lights”, he said. However, at the same time, Pope Francis said, apostolic courage does not tremble in fear “before the hardening of certain hearts that despite good intentions drive people further from God”. Evangelical humility is “emptying oneself of one’s own convictions and prejudices in order to listen to our brother bishops and fill ourselves with God”, he said. It is a humility, “which leads us not to point a finger in judgment of others, but to extend a hand to help them up again without ever feeling superior to them”. The discussions aim at “the unanimity that comes from dialogue”, he said, but can be disturbed by “ideas defended to the extreme”. Hungarian Cardinal Peter Erdo of Esztergom-Budapest, chosen by the pope to introduce the discussion, spoke for close to an hour, outlining the questions the synod will be called to discuss over the course of three weeks. The gathering is set to conclude with a Mass on 25 October. In addition, the cardinal said, with an exultation of individualism there is a widespread distrust of institutions – including of the church, the state and the institution of marriage. At the same time, said Italian Archbishop Bruno Forte of Chieti-Vasto, special secretary of the synod, “the synod is not gathering to say nothing”. The goal is to find new pastoral methods to bring the church “closer to the men and women of its time”.